I know there’s a lot of talk and what have you about if this guy prints more money between now and the election, I don’t know what y’all would do to him in Iowa but we would treat him pretty ugly down in Texas. I mean, printing more money to play politics at this particular time in American history is almost treacherous — or treason, in my opinion. The chairman of the Federal Reserve is supposed to manage monetary policy. Bernanke's increases in the money supply have left inflation at historically low levels. The bad thing that could happen when increasing the money supply is the wrong decision didn't happen. In fact, I think it'd be good to print a lot more money, since there's not enough of it going around. I don't know if there's any precise way to characterize the role of the president in monetary policy. But this, I think, is a minimal standard that Presidents should achieve: Don't accuse the Fed Chair of treason for doing his job, or suggest violence against him. If you can't meet this standard, civilized people should regard you as a barbarian rather than a legitimate contender for political office. This is a rare occasion where Republican establishment power brokers might agree with me. 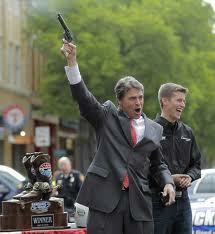 (Republicans, including some who worked in the Bush White House, have criticized Perry's remarks.) Their money is at stake as much as anyone else's if the president is making ignorant threats against top economic policymakers rather than just focusing on how to make the rich richer. If this gets them to pull the plug on Perry's candidacy, they'll finally be doing something in America's interest as well as their own. Update: Brian Beutler's reading makes Perry less of an idiot and more of a thug. On his reading, Perry is intentionally trying to intimidate Bernanke into keeping the economy weak so that Obama will lose. If he's right, this is a kind of threat I've never seen before in US politics. Agree with everything you said. It's disturbing that the GOP now seems willing to run candidates like Perry, Bachmann, and Angle, who are willing to hint at the use of violence to their supporters. It's a step-- a big one-- closer to fascism. Nothing proves to the teatards who control the GOP primary that Perry is one of them more than having the press, liberals, and even the GOP establishment criticizing him all at the same time. He's a shoo in to win the nomination.